VALT 2013 - A Movement and Catalyst for an Alternative Vancouver! Wednesday, November 20th, Vancouver is invited to the opening gala of VALT 2013 - followed by 3 days of shows on the 22-24th. Only in it's second season, this unique blend of alternative fashion accompanied by a great selection of music, performance and art has already has garnered a great deal of attention and support. The number of applications for designers, musicians and artists wanting to be a part can be overwhelming - last year over 250 bands alone applied to fill the ten allotted spaces. Each is individually assessed by an anonymous jury of industry professionals and those accepted are chosen based on the quality of their work and how they fit with the event's annual theme. What is VALT? According to co-founder Kat Ferneyhough, "VALT is a movement; encouraging participants and audience members alike to challenge the conceptions of what defines beauty. 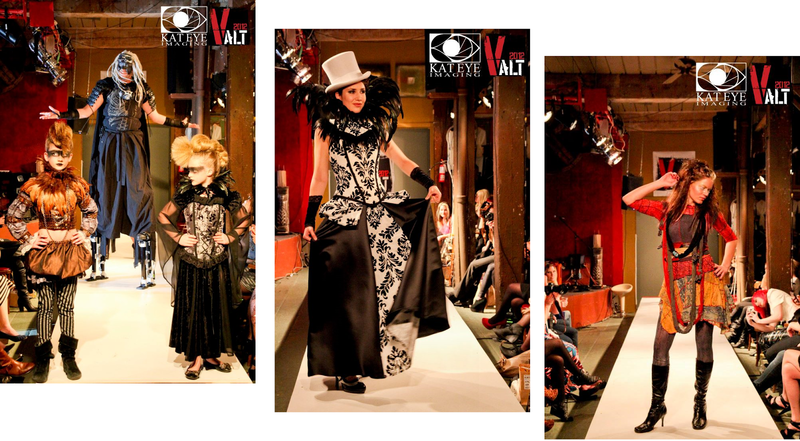 VALT is a catalyst; accelerating the appreciation for adventurous fashion and inspiring the public's perception of wearable art. VALT is essential, because Vancouver is Alternative." One way in particular that founders Kat Kerneyhough and Kat Kozak have chosen to stand apart from other fashion weeks is by using models that represent a wide spectrum of beauty: they include heights from 5' - 6'4", sizes 0-16, all skin tones, nationalities, ages 9-50, a wide range of gender identities, body modification and hair styles with every type and colour you can imagine. Models are chosen based on confidence, enthusiasm and respect for what this unique fashion week is all about. This season, the three nights will each have their own unique theme. Friday the 22nd features Utopia - the ideal future for many, a world in which humankind lives without toil or discomfort. Saturday the 23rd offers Dystopia - a bleak futurescape in which humanity toils and struggles with little to no recompense. Sunday the 24th the event ends with Techtopia - the newly forming idea of a world in which humankind has improved by great leaps and strides from now, mostly with the aid of continually improving technology. Like last year, each evening will include runway, art gallery, photo booth, performance, music and bar. New this season will be the addition of short films and some interactive technology displays. Intrigued? Tickets to the opening Gala at Studio 560 (560 Seymour St.) as well as the new seasonThe Centre for Digital Media Hangar (577 Great Northern Way, Vancouver, BC) are still available. Gala tickets are available through paypal online at www.luvngraceaffair.com, or in person at Beauty Garnet Salon at 1052 Hamilton. Show tickets ($25/day, $60/weekend, $150 VIP) can be purchased online by clicking HERE. Check out this great video documentary covering VALT 2012 edited by Shutter House Films.